A collection of activities and games that can be used to teach elementary level students how to use the present perfect. This lesson plan includes suggested board work, several activities, a game and a collection of specially selected ESL resources from around the web. If you're an iOS or Android user, try this lesson out on our TEFL Handbook app. It gives you offline access to all of our materials, perfect for quick reference in the classroom. 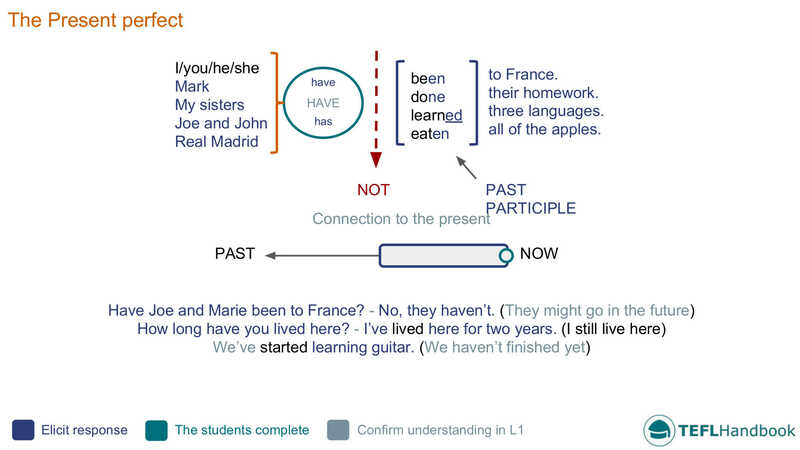 Use this representation to teach the construction of the present perfect. Elicit examples of each component before asking the students to suggest some statements. Have them convert the sentences into their negative form and if you can, an L1 translation. After that, use the timeline to highlight when and why we use the tense, and try to elicit examples of common question structures and short answers. Write the following prompts on the board and have the students make present perfect sentences. Tell them that at least two should be negative. Correct as a group and elicit both the positive and negative solutions. 4. He / Star Wars / yet? 5. You / ice hockey? If you feel the class are capable, encourage them to ask follow-up questions in the past simple to get more information. Demo this before they begin. Teacher: Have you ever been to a music concert? Teacher: Who did you see? Teacher: Where was the concert? Tell your students to make a list of 8-10 things they have or haven’t done in their lives. They will then use this to interview their partner and find out how many of those things they have or haven’t done. Monitor the conversations, encourage follow-up questions and discourage one-word responses. If you have time, ask each student a few questions about what they learned from the interview. To begin, tell your students to come up with three present perfect statements about themselves. One of these should be a lie. Each student will then come to the front of the class and read their sentences while their classmates ask follow-up questions to determine which statement is the lie. 1. Something that they have normally just done at that time? 2. Something that they haven't done yet. 3. Something that they have already done. Give one point for each grammatically correct sentence. You can use a mix of times and time expressions (Nine o'clock in the morning, 12.30pm, half-past eight in the evening etc.). To avoid repetition, limit each verb/activity to a single use and keep track of them on the board. 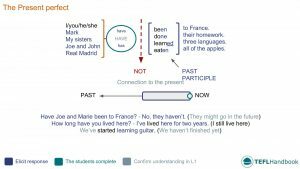 Our suggested next free lesson plan is on using 'since' and 'for' with the present perfect If you've found these materials useful, be sure to check out our full list of A2+ lesson plans. For other levels, have a look at our complete selection of EFL - ESL lesson plans. If you use an Android or iOS device, try out the TEFL Handbook app.